A format string vulnerability is fantastic tool for a GOT table overwrite. But what can we overwrite and where to jump ? Hmm.. Buffer in BSS, fixed offset ? Lovely! User input is stored into the BSS section and this section is RWE ! So our format string will overwrite the GOT entry for send() and replace it with the offset of the user input buffer. I lost a monumental amount of time with an exploit that was working perfectly on my local Debian Squeeze VM and would output nothing on the challenge box. I rewrote it several time with different strategies to no avail. One of our team member tried on his Ubuntu box and it wouldn't work either o_O .. so I fired up a CentOS VM and indeed, the format string had a off by one difference in the second argument. Making the exploit works on CentOS made it work on the Ubuntu and the challenge box. I don't really know what's up with Debian's libc. For the shellcode since there is a small filter, we will just use a XOR-encoded polymorphic shellcode. .text:080488CB mov [esp+1Ch+s], offset aFBxpSpXpcuav ; "õ+íÕÅÀÞ»+ÕÅûÒÇé"
Looks like we have a buffer overflow there Lets check it. Now how can we exploit this buffer overflow to get the key ? Stack is RWE! So we will put our shellcode in the buffer (and on the stack) and jump to ip. To get the right offset on the stack, we will fake parameters push on the stack and call send() to get dump of various memory ranges. The way I went for it is to write a scanner with this infoleak. It will quickly scan the usual range for the stack (0xbfffffff) until it finds some readable data then i will switch to a more precise scanning and look for the nopsled we have put in front of the shellcode. As soon we have the offset of the nopsled, we switch from infoleak to exploit and jump to the shellcode which dump the content of the key file. This a memory overwrite exploit, it's a bit convoluted because ASLR was enabled and so we need to do an infoleak to get the right offset inside libc. 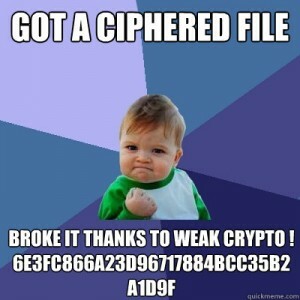 Quick solution post before leaving for vacation for Stripe's CTF Level 8. See RFC 2945 for details on SRP and this reference for Blizzard's specific implementation. 27 February 10:57, by Friendly-Boy - "Hii dude, did u remember to made a backup of ur site for the migration ?" 27 February 10:59, by Admin - "fine, fine and u ? yes ive made the backup yesterday." if hash(user password) != stored _hash, goodbye. And we don't care about the rest of the disassembly because we know we must have a password that match the file stored hash. Which kind of hash ? Obfuscated import and method name. What does decode do ? We don't care. Nice. CRC32 is easy to bruteforce. .text:08048F6B lea eax, (aTheHashIsS - 80E605Ch)[ebx] ; "The hash is %s\n"
ccc function is a simple memcmp. Function WhatisIt is the core of this crackme. It uses 2 tables to transform the password in a bytearray that is compared to a valid bytearray stored inside the binary. print "v=", v, "t=", t, "VALID"
Note: yes, the algorithm can be reversed and the solution is then a simple oneliner, I didn't catch that last night. 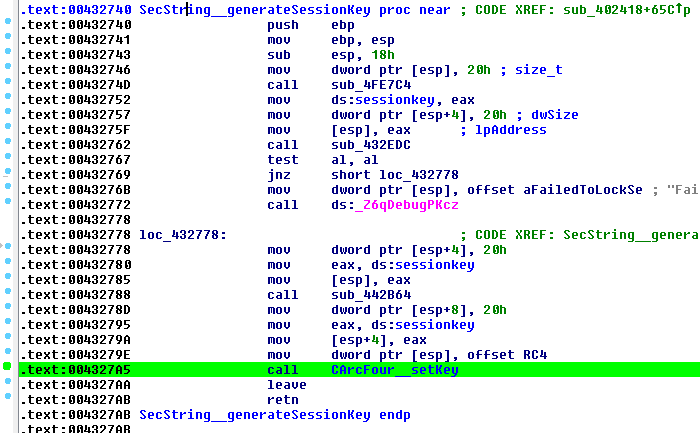 In this challenge we get a Windows XP memory dump and we are told to get the password inside a KeePassX file. We can load the exe file in IDA. Every critical keys is stored encrypted in a modified RC4 form when not being used. The key for all these containers is the same session key. And this session key is stored in a static variable in the bss so the offset will always be the same for a given exe file. 00c01b00 db a9 65 b9 73 a4 40 7a 8f 66 06 90 42 7c 29 92 ..e.s.@z.f..B|). 00c01b10 f7 c2 3c 57 7c 9c f1 fc 9d 5d e8 c5 66 7a 71 b3 ..<W|....]..fzq. Now we need to find in the memory the MasterKey. The MasterKey is the SHA256 hashed password of the kdb file. From the MasterKey, the AES key is derived (SHA) for actual encryption of the kdb file. Trivial: locate the kdb in the memory dump and save it to a file. Kdb signature is "03d9a29a65fb4bb5". Now we have 2 approaches: we can derive the AES key and do manual decryption of the kdb file or we can patch KeePassX to accept a MasterKey instead of a password.